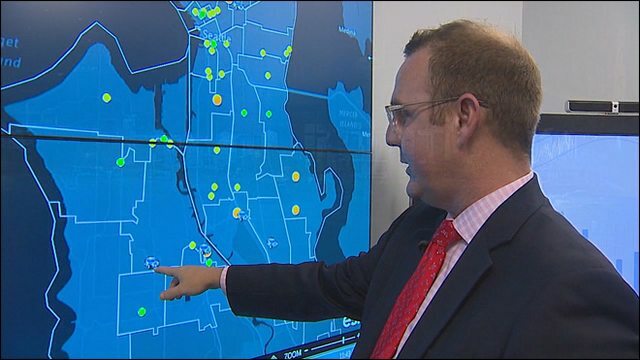 SEATTLE -- The Seattle Police Department unveiled its latest high-tech crime fighting tool on Wednesday. It's more like several tools rolled into one big electronic dashboard. Dubbed the "Real Time Crime Center," the department and its IT staff have turned a room on the sixth floor of police headquarters into an electronic hub of intelligence gathering and officer deployment. "This will be the hub of our agile policing strategy," said Seattle Police Chief Kathleen O'Toole. The center is designed to be a "centralized data and logistics hub" that will help officers on the street to "rapidly identity suspects and solve crimes," according to the department. "Here we combine sophisticated technology, sworn police investigative experience and highly trained civilian analysts," O'Toole said during a press availability inside the center, which became operational July 30th. The centerpiece is an electronic dashboard of monitors that encompass an entire wall of the windowless room. Under the Agile Policy strategy, the department will consolidate the Criminal Intelligence Section, the Data Driven Policing Section and Crime Analysis detectives into the new Intelligence and Analysis Section. Teams from the Intelligence and Analysis Section will staff the Real Time Crime Center. Another new tool the department touted is a computer model that digests historical data with current crime statistics to "forecast" where crime is most likely to occur given a particular date, season and activity -- such as a Seahawks game. "Deploying those resources as soon as you see that spike, that's the real game changer and what makes this Real Time Crime Center different than what we had before," said Seattle Police Chief Operating Officer Mike Wagers. The department hopes to improve responsiveness as crime unfolds using data-driven strategies and tactics. The analysts gather information collected from 911 dispatch calls, SeaStat data, radio traffic, and vehicle information data. But there are no plans to live stream dash cams and body cameras worn by officers. "There are other uses for the dash cams and the body cams, that's not part of the Real Time Crime Center," said Wagers. Since the 9/11 terrorist attacks, there's been a concerted effort by local, state and federal law enforcement to share intelligence through fusion centers. The goal is not to hoard and protect intelligence from another agency. Chief O'Toole says the department will continue to share with the state's Fusion Center. "We are following the letter of the law in terms of all of our intelligence policies," she said. "We are sharing information when it's appropriate and we are sharing it with our regional partners rather than keeping it within the corners of Seattle." The center is funded through a combination of asset forfeitures and a Department of Justice grant of $411,000. The department says a portion of that grant will fund a team of research scientists that will continue to refine best practices of the center to improve public safety.